Are you used to apply your Vinyl transfers using an iron? Are you looking for a more efficient way to do that? Well, you came to the right place. 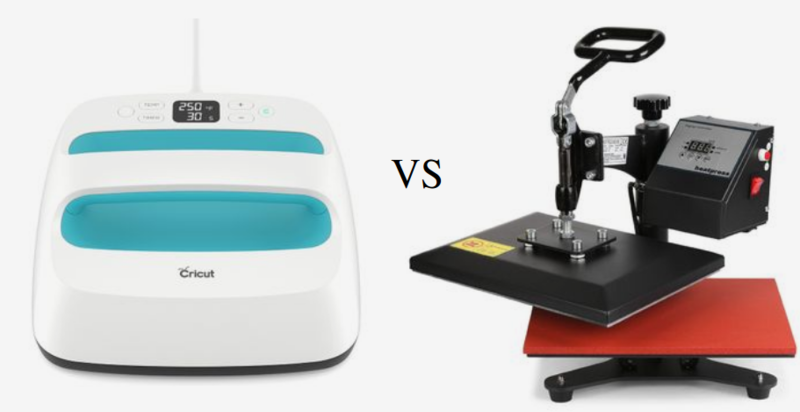 In this article, I will take you through several Cricut easy press machines reviews. As usual, if you are in a hurry, here are our best picks for you. 1 The brand: Who is Cricut ? 6 Should I get one or go for a standard heat press? The brand: Who is Cricut ? 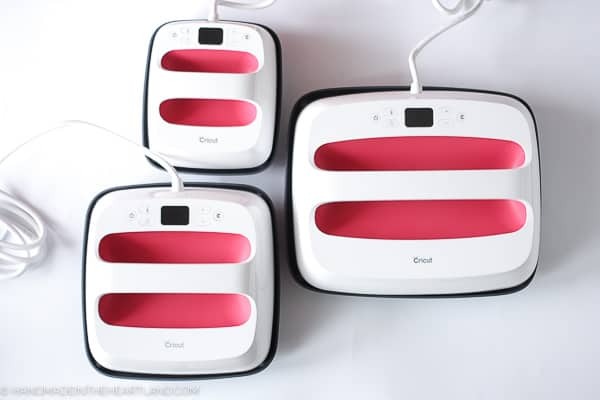 Cricut is a brand name of a range of products designed for scrapbooking projects. However, in recent years, they decided to attack the fabrics press niche with first the Cricut easy then with an updated version, the Cricut easy press 2. The owner of the brand is the American company Provo Craft and Novelty .inc. I decided to write this Cricut easy press reviews since they seem to be one of a kind. The Cricut easy press is the unlikely marriage between an iron and a heat press machine. However, it is safer and easier to use. It consists of a heating side which can reach 350° Fahrenheit ( 180° Celcius). The temperature and the time to apply the temperature are settable via a digital controller. It is possible to control the temperature with a 5° precision. “Iron-on success in 60 seconds or less”. This is a catchy phrase from Cricut to promote the easy press. Put your T-shirt (or fabric) on a flat rigid surface. I advise you to put a protection mat under your T-shirt. Do not use any plastic surfaces since they can melt. Once the temperature reached, take your easy press out of its base, put it on the transfer paper which should be on your T-shirt. Be careful to not move the transfer paper when you put the press on it. Apply some pressure until the timer reaches 0. Don’t forget to start the timer. Wait for the item to cool off then remove the transfer paper. As you can see, it is pretty easy to use the Cricut easy press. Moreover, what is important to know is that it is extremely safe to use. Unlike a standard heat press, only the “ironing” side will heat up. The top of the machine is safe to touch and safe to manipulate. Also, if you forgot to shut down your machine, it will automatically turn off after 10 minutes. Let’s not forget also that with the safety base, you won’t have to worry where to put your machines until it cools off. 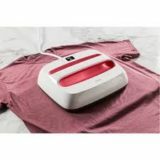 Compared to an iron, the Cricut easy press’s base is supposed to heat uniformly unlike an iron where the heat is unevenly distributed. Unless there is a problem, if you set a temperature, let your machine heat up and measure the temperature on different positions. There shouldn’t be any major differences. There is an improved version of Cricut easy press called simply Cricut easy press 2. In how is it different from the Cricut easy press? Well, keep reading! The Cricut easy press 2 is a slight improvement over the genuine easy press. There are 3 different models for the easy press 2. There is the Cricut easy press 2 9×9, Cricut easy press 2 6×7 and the Cricut easy press 2 12×10. What are the differences? Are they meaningful? Well, let’s find out together. 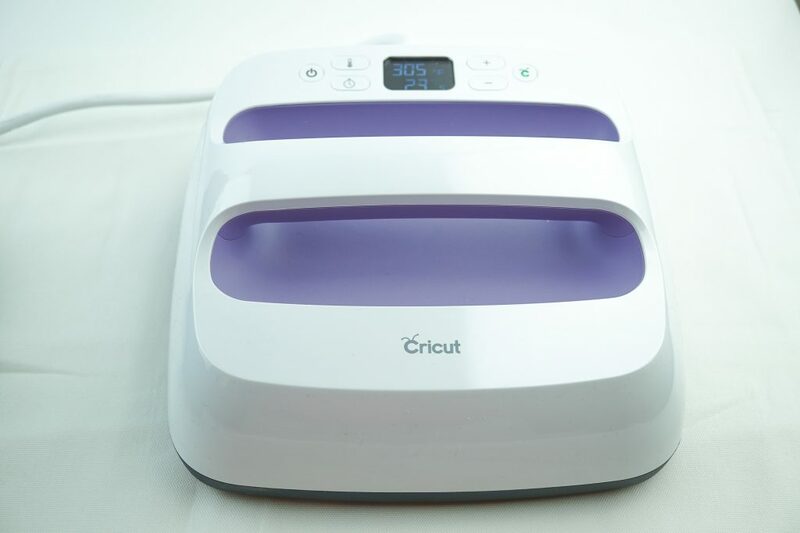 Cricut easy press 2 6×7: It has a 6×7 inches heating plate. This size is perfect for baby clothes and small designs for imprinting. Cricut easy press 2 12×10: This is one is the biggest in this family of machines. With its 12×10 inches, expect to print bigger designs on bigger items. One of the promises of the Cricut easy press 2 is that it is supposed to heat fast. 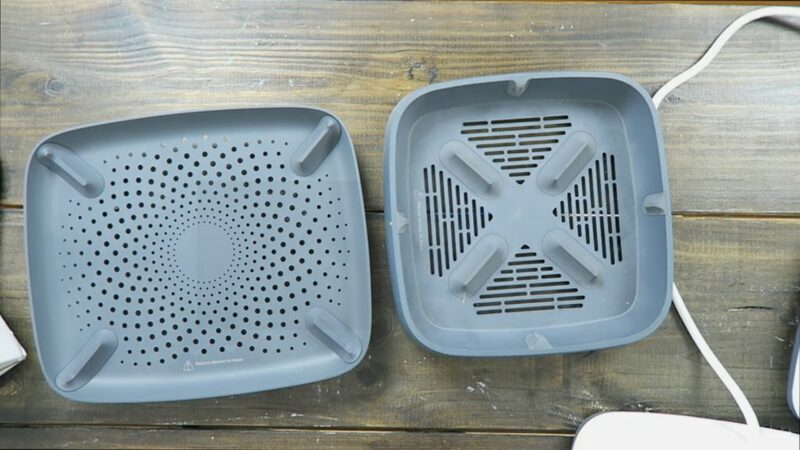 In particular, since the Cricut easy press is a 9×9 machine, the Cricut easy press 2 9×9 is supposed to heat faster. The heat up time is supposed to be improved by up to 25%. 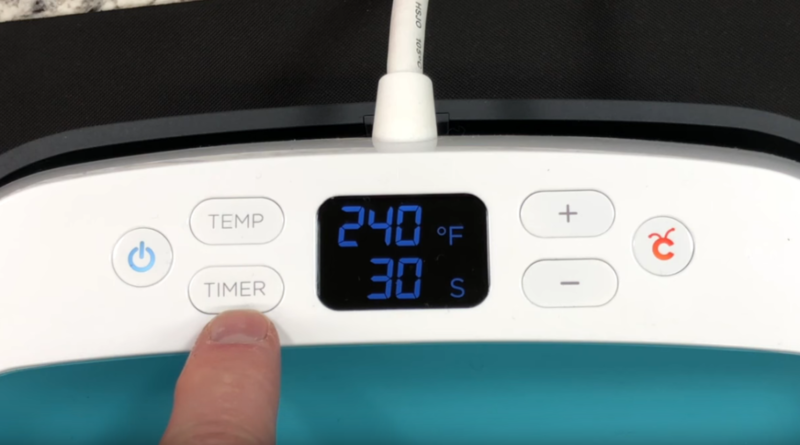 While the genuine easy press reaches temperatures up to 350° Fahrenheit, the Cricut easy press 2 heat press reaches 400° f. This means that with this product you can transfer your vinyl on more materials and improve the quality of your transfers. There is no better way the describe the changes in the safety base than a good, nice picture. The new device is absolutely nice to look at, while the first one is just ok. This is not a difference between the two machines. It is more about a common point between the two. The Cricut easy press family of products comes with a detailed user manual. Also, a detailed guide about the settings is available on-ine. On the other hand, not all the available heat press sellers pay attention to this critical detail. Since Cricut is an American company based in America, getting in touch with customer service will be much easier for you. Before ending this section, one meaningful information to know is that the feedback from the users of the Cricut is highly positive. They seem to love its design, its lightweight and the fact that it is not hard to use. 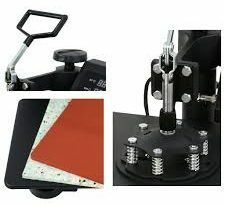 If you are still hesitating about either purchasing an easy press or a standard heat press machine, this section is for you. One of the best selling arguments for Cricut heat presses is its safety. The top of the heating plate of a usual heat press machine becomes hot when the heat press is running. This increases the risk of burn injuries and accidents. Meanwhile, with the easy press, only the plate will heat up. The up of the machine is still safe to touch. Also, let’s not forget about the safety base provided to put your heat press on when you finish your work with it. 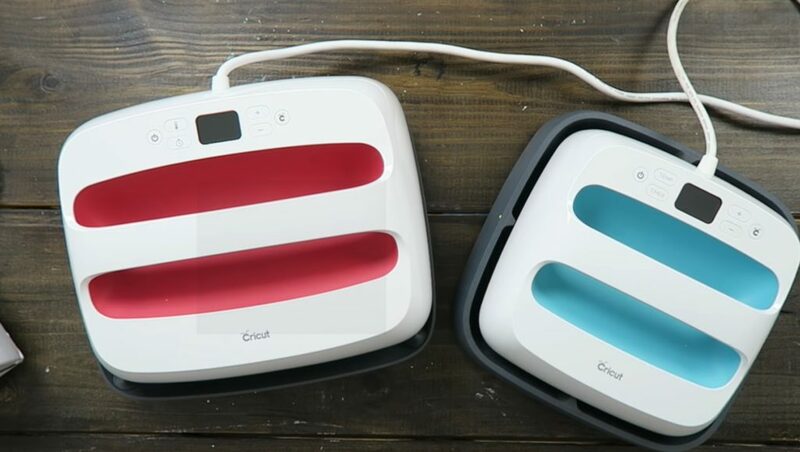 The cricut easy press is a portable machine, while in general heat press machines are not supposed to be moved around a lot due to their heavy weights. In fact, the lightest heat presses are not comparable to the cricut easy press in terms of weight. 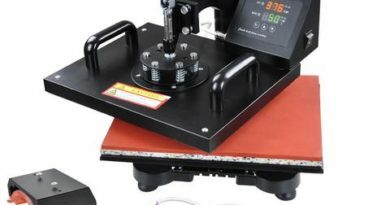 For instance the 12×10 inches FancierStudio heat press is shipped in 28 pounds package while the Cricut easy press 12×10 is in a 14.8 pounds package. 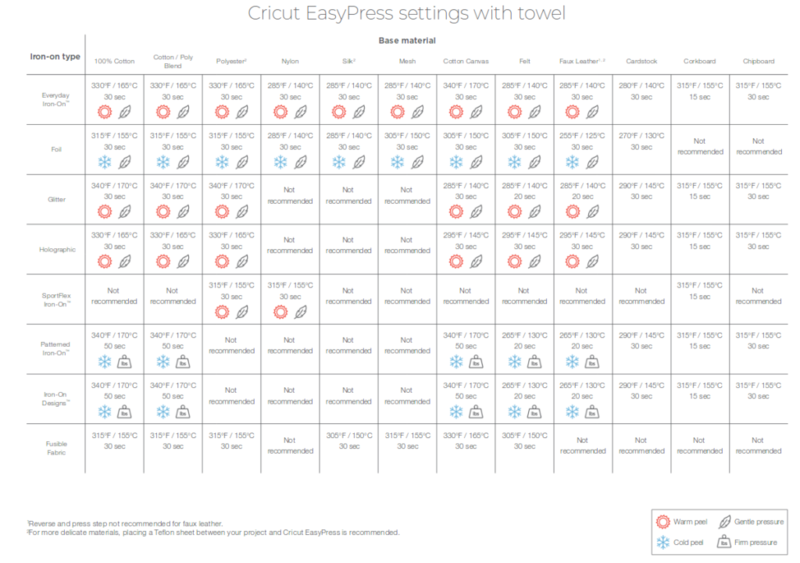 The Cricut easy press settings are easy to set thanks to its intuitive design. From a design perspective, the digital controllers are not the same. But, technically speaking they provide the same functionalities. However, the pressure applied with heat press machines is much higher and easier to apply than with the Cricut easy press. In traditional machines, all you need to do is to put the handle of the press in the printing position. In contrast with the easy press, you need to keep pressing your item while the countdown of the timer is still ongoing. Also, it is harder to apply even pressure using the easy press. 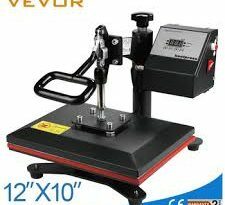 Should I get one or go for a standard heat press? My answer to this question is simple. If you want to use the easy press for a small business, I honestly don’t advise you to go for it. 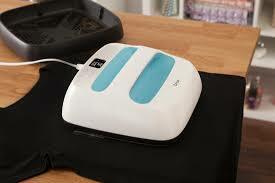 Instead, have a look at my last review on the best heat press for a small business. However, if you want to use it at home and have a lot of little hands everywhere, the heat presses from cricut are definitely for you. If you just want to get started with small objects, go for the cricut easy press 2 9×9 model or the first model. However, if you want to start with bigger objects, go for the easy press 2 12×10 model. Do not hesitate to drop a comment for any questions!